RAIPUR'S air is euphoric. The secretariat, earlier the main civil hospital of the city, still smells of fresh paint. 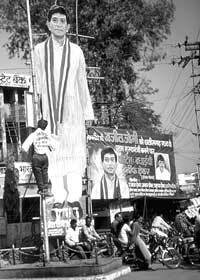 A huge cutout of chief minister Ajit Jogi overlooks its premises, while residents of Raipur eagerly debate the future of this natural resource-rich state and the opportunities it brings. The general belief is that there will be a change towards better governance. But in stark contrast to the euphoria in the capital and other urban areas is the cynicism in the drought-stricken villages. "Madhya Pradesh or Chattisgarh - it makes no difference," sums up Kunjarani Devi, 35, of Bindra Naoagarh in Raipur district. Experts say that the movement for a separate state was an urban one led by politicians and businessmen. The new status is unlikely to make notable changes in the rural lifestyle. Currently, only 16.6 per cent of the agricultural land is irrigated. In most areas, only one crop is cultivated annually. This year there has been a 50 per cent drop in the rabi (winter) crop production. Almost 1.136 million ha of land, most of it belonging to marginal farmers, and almost 30 per cent of the cattle population are affected. In some districts like Raipur, the watertable has gone down drastically. "Groundwater meets only 50 per cent of the demand in Raipur but there has been no initiative for harvesting water," says A Mukherjee, assistant hydrogeologist at the Rajiv Gandhi National Groundwater Training and Research Institute, Raipur. For the new Congress administration, staving off the drought is topmost on the agenda. But, not very different from many state governments, it hopes to do so with financial assistance from the Centre. "The entire machinery is geared to tackle the drought," said Jogi at a press conference three days after the formation of the state on November 1. Three weeks later, nothing much had happened. "The central government has not released any money," he said (see interview: The wealth of the state should remain within the state). In the meantime, collectors have been instructed to construct bunds across nullahs and rivulets. Each minister has been given charge of one district (Raipur is under Jogi) and the authority to take on-the-spot decisions on relief work. Collectors have also been asked to gear up developmental work under different schemes to provide employment. According to M K Raut, secretary, revenue department, Rs 9,887 crore is needed to make drinking water available throughout the state. A new scheme of digging ponds in 17,000 electrified villages is underway. "But this is not enough," says Gautam Bandopadhya of Ekta Parishad, a well-known non-governmental organisation (NGO). "At the ground level, neither the MP government nor the new one has taken any initiative to give a boost to save the region's traditional knowledge to tackle the drought," he adds. "We don't have tubewells or irrigation facilities," says Gahsiya, a resident of Salebhat village in Kanker district. People are leaving in droves in search of work. "Every year, migration starts after Diwali. But this year the people have left even before Diwali and for the first time they are taking their families with them," says Brij Mohon Agarwal, former Bharatiya Janata Party (BJP) chief whip in Madhya Pradesh. The 11th Finance Commission had given Rs 70.59 crore for augmentation of traditional water sources and Chattisgarh will get a part of it from MP in the next budget. "This should help in undertaking drought-proof measures," feels Sunil Kumar, secretary to the chief minister. But Agarwal is critical of the government's efforts. "The administration has not been able to control the drought. Ajit Jogi has not even called an Assembly session to discuss the issue," he says. While tackling drought, the government is also keen on "developing the state" by relaxing mining policies and opening up forest areas on a sustainable basis, says Jogi. It has immense bauxite, coal and iron ore deposits. The total revenue from minerals in 1999-2000 was Rs 395 crore. Experts say that diamond deposits in the Deobhog region alone may give an annual revenue of over Rs 10,000 crore. "Chattisgarh should have its own mining policy. We should explore the rich deposits and use them for the state's development," says Ram Pukar Singh, the state mining minister. There are, however, controversies surrounding mineral prospecting in the new state. Jogi is already under political pressure for his decision not to review the diamond mining deal with South Africa's De Beers. Prior to the formation of the new state, Jogi had vociferously campaigned against signing the diamond deal by MP chief minister Digvijay Singh. He is of the opinion that prospecting should be done only by Indian companies and the wealth should stay within the state. Insiders say that the company - B Vijay Kumar and Company, which is now prospecting - is the Indian subsidiary of De Beers. The 460,000 ha Deoband-Mainpur area was leased to the Mumbai-based company for a period of three years starting January 25, 2000. Recently, the Union minister for mines, Sunderlal Patwa, while answering a question in parliament, had stated that the firm has been given permission only to conduct an aerial survey in Beradih block in the area. But, currently, there are 30 geologists, including four foreign nationals, residing in the area. By their own admission, they have been deputed for fieldwork. Pits and bores have been dug. Residential quarters are under construction and a laboratory has also been built. So far, 7,500 kg of samples have already been despatched for analysis, a company official admitted. Ironically, the Raipur office of the MP Geology and Mining Corporation says it is unaware of the activities going on in the area. The other contentious issue for the government is that of forests. The total area under forests is 5.7 million ha, which is 42 per cent of the total land area. The revenue generated, including that from MFP, stood at Rs 122 crore in 1999-2000. If managed properly, it can go beyond Rs 500 crore, says R C Sharma, principal conservator of forests, Chattisgarh. The government is also keen that MFP becomes the basis of economic regeneration for the tribal people, who comprise one-third of the population. It is keen to provide a minimum support price. "A committee has been set up to prioritise the ones we want to give MFP status. Like the existing tendu patta policy, we will have cooperative societies and bonus will be given after products are sold off," says Sharma. In early 1999, a new scheme was started in Bastar. Van dhan societies were formed to buy MFPs from the primary collectors and were marketed by the Tribal Cooperative Marketing Development Federation of India. In this way, the tribal people were ensured the market rate for MFP and kochiyaas (agents) were eliminated. "But unlike van dhan, we are going to encourage local entrepreneurship and whoever offers the highest rate will be given the contract for the entire season. The forest department will work as a facilitator," says Sharma. Most of the tendu-rich areas are also facing Naxalite problems. Naxalites have always held that the tendu patta collection policy is anti-people and the bonus never reaches the people at the grassroots level. Jogi agrees that it is a problem arising out of socioeconomic disparities, which needs to be looked at. "I won't be able to say anything more than the fact that we promise to save our forests and wildlife and look into the needs of the tribal community at the same time. We are working on the policy but as of now we are preoccupied with the drought problem," says Tuleshwar Singh, minister of state for forests. But one thing is for sure, he adds, "The tribal people will be given the upper hand." The entire issue requires a relook, says Sudip Banerjee, principal secretary of forests, MP government. "Firstly, the ForestConservation Act must be amended. The term forest is much larger and includes the people living there. But this is not recognised. Even to construct a road, a school or a hospital, we have to go to the Centre for permission." He is of the opinion that if the act is not amended, forest-rich but extremely poor and remote areas like Chattisgarh will not be able to benefit from development. Agrees K K Chakraborty, principal secretary of forests that there is political and market pressures, "but we have to survive these pressures and protect the forests through people's participation." The thrust will be on culture-specific policies, which will help in reviving the tradition of sustainable resource management. "This will help the tribal people go beyond subsistence living," he says. The key to proper resource management would be good governance. But many experts question the professional integrity of those responsible for it. Some bureaucrats and politicians who have Central Bureau of Investigation inquiries pending against them for illegal logging are in power. "This has sent wrong signals to the people. For instance, Narayan Singh, who is a principal secretary, is under scrutiny and so is industry minister Mahendra Karma," says Bandopadhya. Kumar says transparency is the key to good governance, and this will be kept in mind by the government. "The chief minister is keen on this. The decisions taken by the government, along with those that were considered, will be displayed on the Internet, which will be accessible to the people. We will see to it that the gram sabhas are duly empowered," he adds. The challenges are aplenty for the new leadership, but there are solutions, too, as long as they wish not to ignore them.